Delaware Arts Info: Two Harpsichords, Two Guest Artists, One Premiere & "Catch 1"
Two Harpsichords, Two Guest Artists, One Premiere & "Catch 1"
Mélomanie’s concerts just keep getting better and better. Not that this innovative ensemble — that looks both to the past and to the future — ever delivers anything short of sheer excellence. 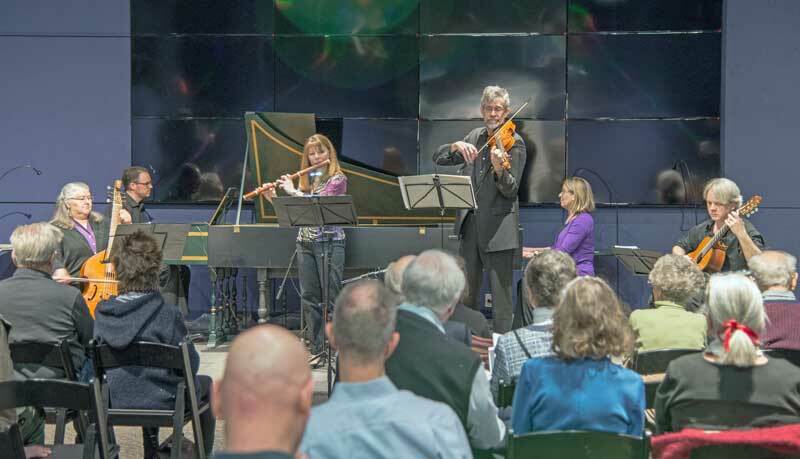 But Sunday’s concert at The Delaware Contemporary knocked it out of the park with a World Premiere, the graphic notation of Polish composer Roman Haubenstock-Ramati, two guest artists as well as some delightful selections from the Baroque era. The ensemble opened the concert with an extremely well-polished and impeccably precise rendering of the Chaconne from Marin Marais’ Suite 1 in C major (from Pieces en trio 1692). Mélomanie performs with guest artists Matthew Bengtson & Chris Braddock. Harpsichordist Tracy Richardson then joined composer Christopher Braddock on the octave mandolin for a performance of Pluck, a piece that Braddock wrote in 2009 — a time when Braddock said he had far less personal responsibilities. Braddock explained that he chose the instrument because it produces some of the low-end heft of the guitar along with the fiddle-like bounce of the mandolin, making it the perfect vehicle for Pluck with its idiomatic folk-style writing. It was most interesting and entertaining to hear Richardson and the harpsichord take to the folk medium like second nature. The highlight of the first half of the program, though, was Haubenstock-Ramati’s Catch 1 (1968) for two harpsichords adapted in Caught (2018) by Mark Hagerty. It’s doubtful that many in the audience ever heard anything by this composer since discs documenting his work are quite rare. Haubenstock-Ramati’s aim was to move musicians far beyond what he perceived to their comfort zone of conventional notation. Yet the question of how to interpret his pictorial images remains. Hagerty’s realization features notated passages and snippet that can be freely selected and varied by the interpreters — in this case, Richardson and guest artist Matthew Bengtson — in response to the graphic notation. It’s doubtful that anyone in the audience had ever heard music like this before. The experience would have been complete had there not been a technological glitch that prevented concertgoers from seeing the actual notation. Nevertheless, this was truly “music for the moment,” as Hagerty urged audience member to listen without regard to what came before or what was to follow. Following intermission, Bengtson offered two selections from Pieces de Clavecin by Armand-Louis Couperin, cousin of the more famous Francois. Armand-Louis’ work is generally not considered as sophisticated as Louis’ but it is attractive and full of personality. Bengtson interpreted “L’Afflige” and “L’Intrepide” with sensitivity and intelligence. He was particularly successful in keeping Couperin’s rhythms flexible without distorting them and without sacrificing spontaneity. Bengtson then rejoined Richardson for a vivid, imaginative performance of the Duetto I in C major for two harpsichords by Christoph Schaffrath, an important harpsichordist and composer in the court of Frederick the Great. Both were impressive in their execution of these demanding keyboard parts. The concert concluded with the World Premiere of Braddock’s Hooks & Crooks, which the composer explained was written during a series of family vacations at various locales. Scored for flute, violin, viola da gamba and guitar, the work showed Braddock to be a flexible, eclectic composer with a sense of humor. The ensemble played with customary vitality and color as the music faded like a summer memory. Wonderful writing and an excellent explanation of this colorful and interesting concert.